FUNCHAL (Portugal), 04 February 2014 – Youthstream presents the fifth issue of the MXGP Mag featuring the complete list of the Officially Approved Teams and Riders for the 2014 season, a special feature on the comeback of Husqvarna and a deep interview with Dave Nicoll. FUNCHAL (Portugal), 7 January 2014 – The fourth issue of the MXGP Mag, which contains all the details about the 2014 Calendar, is already online. This month the MXGP Mag also includes a special feature on the 2014 TV Production, an article on the MXGP Academy and an overview on the FIM Asia elections. On the 1st December, Monaco hosted the 2013 FIM Gala in the prestigious Salle des Étoiles. Amongst more than five hundred guests the MX1 World Champion Antonio Cairoli and MX2 World Champion Jeffrey Herlings stood out among all the awarded riders. For the MX3 World Champion Klemen Gercar it was a very emotional evening and the Junior Motocross World Champions, Pauls Jonass, Conrad Mewse and Aiden Tijero captivated the audience with their charisma. 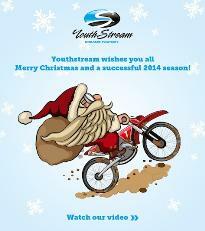 FUNCHAL (Portugal), 5 December 2013 – Teams and Riders will receive a significant support from Youthstream for the Overseas Grand Prix events, the decision confirming Youthstream’s strategy of expanding the series worldwide.